David Eby is stepping down, so the BCCLA is hiring a new Executive Director. The job posting has a long closing date (September 7, 2012). The position requires a law degree. I’ve worked with David on several issues during his time as ED, and I wish him all the best in his future endeavors. Your June 29, 2012 e-mail addressed to the Ministry of Justice regarding your request for copies of archived Esquimalt Police and Fire Department audits, has been forwarded to the Policing and Security Programs Branch for reply. The audit reports you are requesting have now been archived and will require a Freedom of Information (FOI) request under the FOIPP Act. More information on how to file a FOI request can be found at: http://www.gov.bc.ca/citz/iao/foi/process/index.html. For more information the FOI office can be contacted at FOI.Requests@gov.bc.ca or 250 387-1321. We hope this information will be of assistance to you. Thank you for writing. Years ago, these audits were public documents and they were available to everyone. Now a Freedom of Information request is needed? 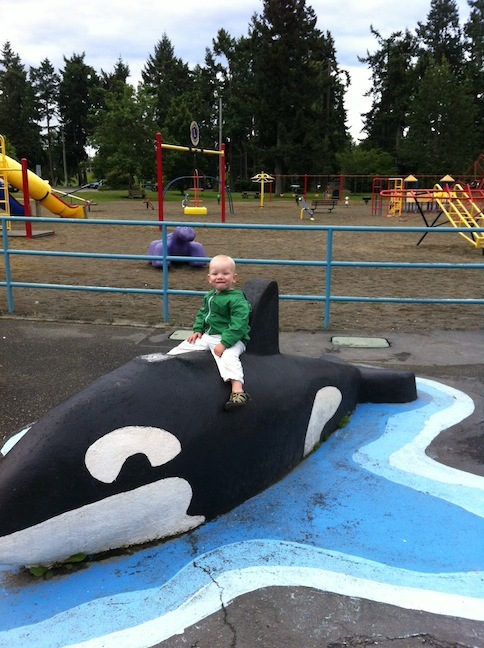 Here is my son at the Parksville water playground last weekend. You can see the Parksville Lions Club sign in the background. They have been maintaining the playground since 1985, and they added the water park in 1991. What a great organization! Thank you Lions Club for making my little boy so happy.